Mike Mignola skipped a huge chunk of Hellboy’s life when he first introduced his signature character in 1994. The 50 years following Hellboy’s arrival on Earth have gone largely untouched by Mignola and his collaborators on Hellboy, B.P.R.D., and assorted spin-offs, but the demon hero’s past finally gets the spotlight in December’s Hellboy And The B.P.R.D. #1, a new series by Mignola, B.P.R.D. writer John Arcudi, and the acclaimed art team of Alex Maleev and Dave Stewart. This preview of Hellboy And The B.P.R.D.’s first issue (on stands December 3) focuses on Professor Trevor Bruttenholm, Hellboy’s human father figure. However, the big red guy’s appearance has intense impact thanks to Maleev and Stewart’s striking artwork. Mignola and Arcudi have a reliable track record working together, but the main attraction for this title is the art team. 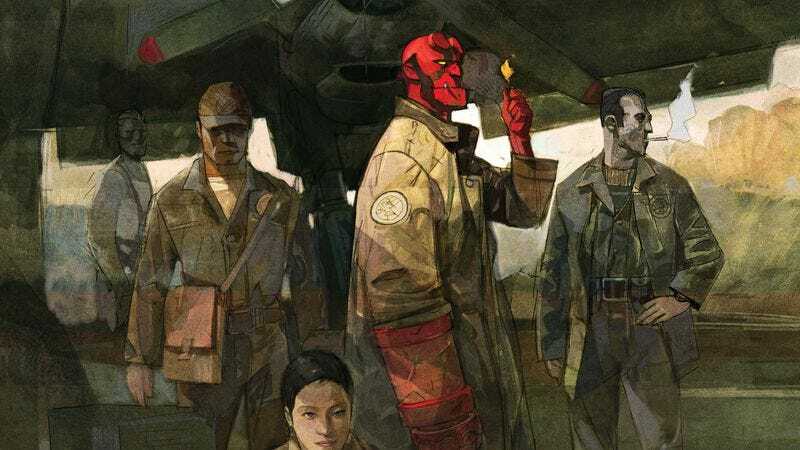 Maleev previously tackled Hellboy in a short story for the Hellboy: Weird Tales anthology, and re-teaming him with his Daredevil collaborator Stewart has garnered exceptional results in these five preview pages.